1- Action sentences are written in parenthesis! Action sentences focus on the how—what is happening the audience sees which performers ACT out. 2- Songs are short sentences grouped in four… like a poem and there may be verses. Or A B A patterns. They have more form and structure than recit. Royal Family: (upset) Go catch those chickens, Those pesky chickens! Go catch those chickens now! They’re breaking things! Those pesky chickens! They’re causing trouble! Those pesky chickens! They’re laying eggs, Oh Wow! What a mess! Those pesky chickens! Get rid of them, but HOW? Songs focus on the why—the emotions that drive the actions. Or NEWUB: Needs, Emotions, Wants and Underlying Beliefs. See how the next song example focuses on the emotions of the chickens…and their wants and needs! Chickens: (worried) Wake up! Wake up! Don’t kick us out! No, no, no! We need a place to run and play! 3- Recitative (Recit) Is conversation which is sung. It gets action going again focusing on information that motivates action. King & Queen: (panicked) Help! Staff, please come help! The Libretto cycle may be modified to fit the needs of the story, however, it always starts with Action and then goes to Song…it can go back to Action without using Recit or even from song to another song. Here are some examples of how the cycle flows! Chickens: No, no, no! We want to stay! No, no, no! We won’t go out. Not even if we could. Hey look! Royal Family: Oh no! Oh no! Those pesky chickens! Get them out of my room! You will ruin our royal things! Staff: Oh no! Oh no! Those pesky chickens! Those pesky chickens have locked the door. We have the golden key! We hope they keep on sleeping. Let’s put them in a pot. 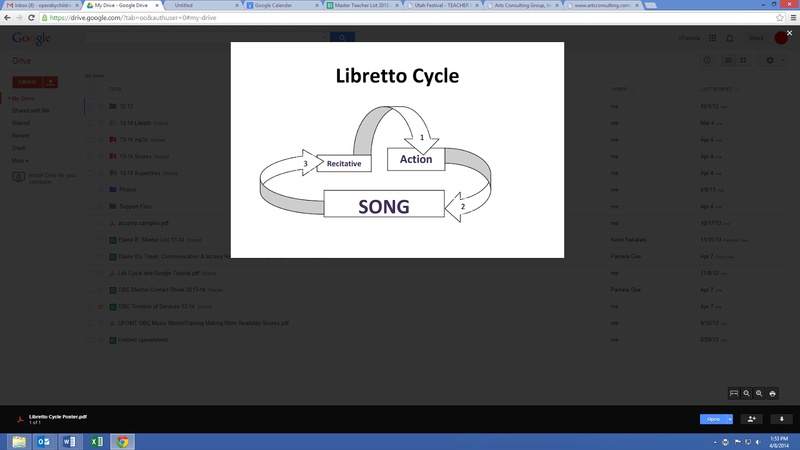 More Important Information: As you ask the students to implement the use of the Libretto Cycle, also employ the “S” Guides as well. ….it is, in fact, the perfect length for …. A Kindergarten or first Grade opera! This is about 400-500 words in length. A libretto by an older class should NEVER exceed 1,000 words. This count includes ACTION words. Remember this is the MAXIMUM and it is not a goal to be reached. It is merely a guide. it takes four times as long to sing something as it does to say it because of the music structure. You want to allow time for action music which helps to communicate the story. I color coded the TOOLS: Action (red), Song (back to back Song is this two hues of blue color) and Recitative (green) so you can easily see how they flow back and forth in purpose and use. Royal Family: Go catch those chickens Those pesky chickens! King and Queen: Help! Staff, please come help! Staff: The chickens must go! The chickens must go! We’ll get those pesky chickens to go! We’re chasing them out! We’re chasing them out! We’ll get them out for sure! Shoo you chickens! You pesky chickens! Out of the castle with you! Butler: Make sure when you leave to close the door! Not even if we could. Hey look! This room is good. Chickens: Wake up! Wake up! Cluck, cluck, cluck, cluck! Royal Family: We have an idea! A grand idea! A royal idea! Hark now! We’ll build a coop! A chicken coop! Behind our castle! We shall! Staff: Yes-ity! Yo! Yes! We’ll build a coop! Yes-ity! Yo! Yes! A chicken coop! Yes-ity! Yo! Yes! A royal chicken coop! Chickens: Yay, yay! This coop is the best! This coop is the best! It will be our new nest! We have a place to run and play! Everyone: The chickens are out of the castle! Those pesky chickens are out of the castle! We are so happy! We solved the problem! Everyone is happy now! Everyone is happy now! Previous Post OBC Advocacy!! We appreciate the support! Next Post Curtain Speech for OBC and performance tips for the teacher.